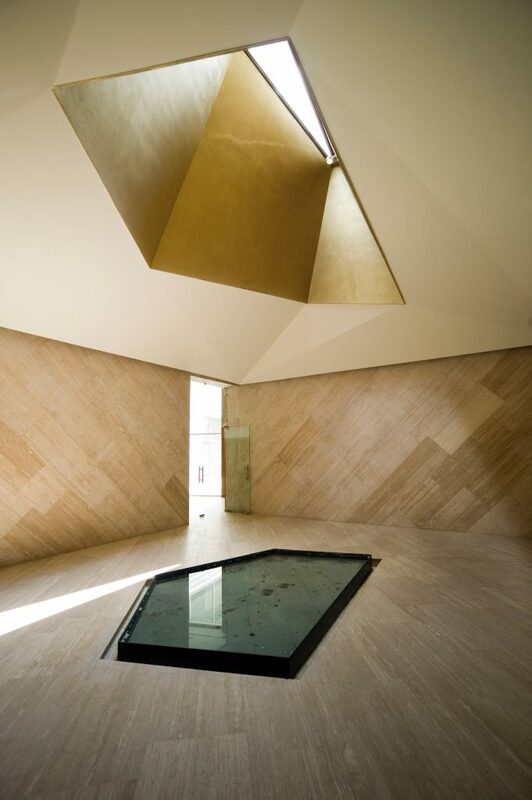 The studio made sure they wouldn’t leave the internal environment behind and preserved the abstract complexity by building the main temple hall, teaching rooms and monks’ cells. Masterfully manipulating the single sheet of fabric the studio managed to create a temple which is both great and solemn architecturally. The temple possesses the shapes which seem to sweep you over like a sea. 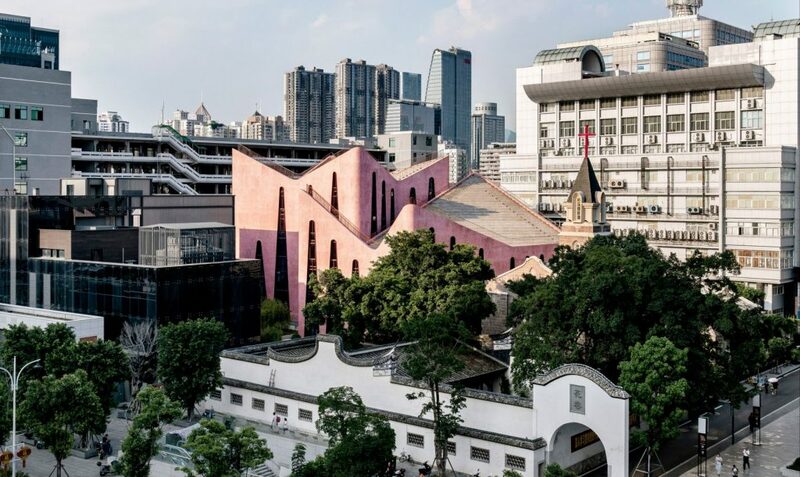 Inuce, an international union of architects based in Europe, has built a distinctive looking church in southeastern China. 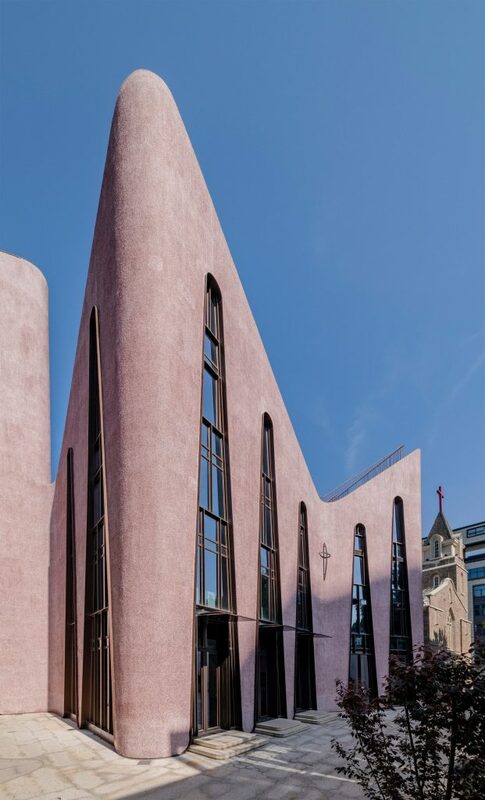 Through the use of pastel pink painted walls, the architects aimed to imply the church’s rising number of believers among young people. The name of the studio is derived from Latin “In Nuce”, or “in a nutshell” in English, is to indicate the simplicity and unpretentiousness of the studio’s practice. As we contemplate their work nothing ostentatious stands out but this, by no means, makes discovering the church as you simply walk along the street an even more memorable experience. The construction’s diverse height and forms allow all the passers-by to distinguish it from the surrounding urban environment. 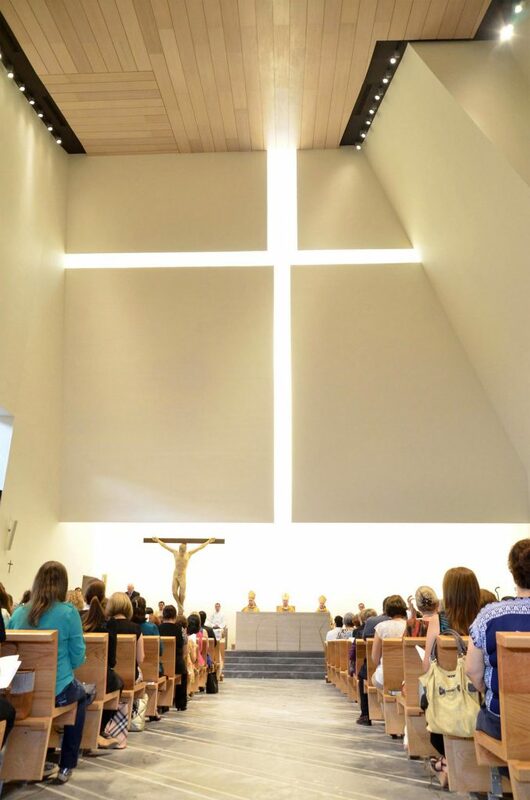 The designers’ intention to make the church as spacious as possible sparked them with an idea to create two amphitheatres on the rooftop of the building with the purpose of leading open-air services. Besides that, the building’s inner environment includes a large hall which can accommodate 1500 people and a multi-functional area with a capacity of 500 people. The next example of a modernized church is the creation by architectural studio Moneo Brock located in a new town-like urban development in Monterrey, Mexico. First and foremost, one should pay attention to the sitting of “El Señor de la Misericordia”. 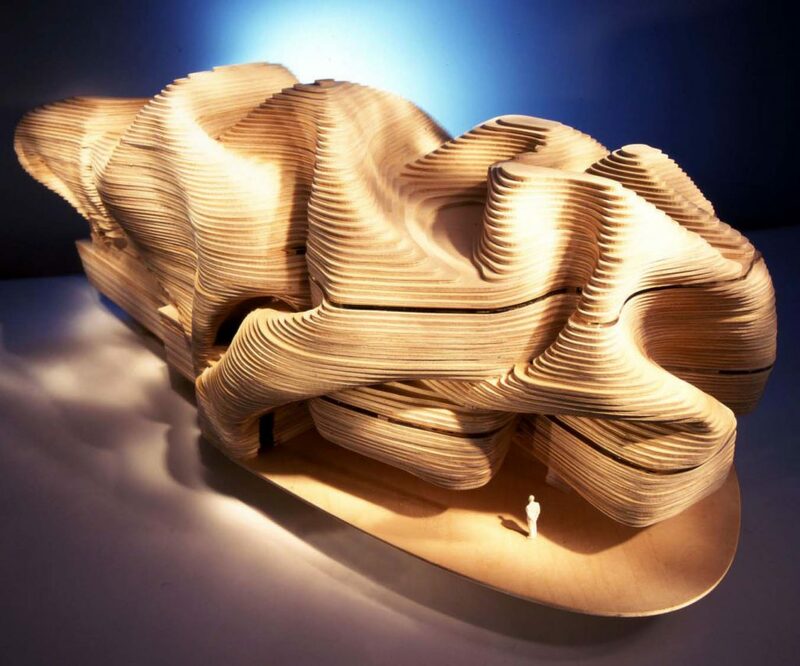 The building is encompassed by a spectacular view of the mountains, and compliments the area by sharply pointed forms which appear to be a logical continuation of the mountain hills on the background. The architects had a clear sense of place and purpose, so they designed the church in concordance with its original objective. Their versatile project combines both the contemporary and ecclesiastical, and preserves all the characteristic elements of the Christian church: a bell tower, frontal altar, choir, three chapels and stained glass windows.